At Mill Creek you can always be assured of a risk free remodeling experience. With Guaranteed Installation, top brand warranties, and easy payment financing any flooring project becomes worry free. Our friendly design consultants will help you access all the latest colors, styles, and product trends from top brands - like Armstrong, Shaw Floors, Mohawk, Karastan, and StainMaster - making it easy to get the look you want. At Mill Creek, we pride ourselves on carrying the top brand names in the industry. Every product we sell is backed by the manufacturer’s warranty. Carpet is still the primary flooring choice for many. After all it offers more color and texture options than any other product on the market. From traditional to contemporary, casual to formal, you can always find a carpet that will compliment any interior and give you years of beauty and performance. Get the look of wood without the worry and capture all the warm colors of natural wood with the durability of tile. Available in a beautiful palette of colors, this flooring is the perfect choice for rustic interior settings AND it comes at the very affordable price of $1.59sf! Luxury Vinyl Flooring gives you the look of wood with worry-free maintenance. If you’re looking for a strong, durable & waterproof floor – this is your perfect match! It’s ideal for kitchens, bathrooms, mudrooms and can even conceal imperfections in subfloors. Mill Creek a wide variety of colors & styles to choose from. Starting @ $0.99 sf. Subway tile provides a classic look that is extremely versatile and can be paired with just about any kitchen or bathroom style. With so many layout options, accents and grout colors to pair with we can help you turn these simple 3x6 tiles into a masterpiece! *Tiles sold by box only. Each box contains 136 tiles (16.456sf). The beauty of ceramic tile is the flexibility you have with design options. Ceramic flooring offers you a multitude of styles, textures, patterns and price points. Many of today’s popular styles of ceramic tile are designed to look and feel like natural stone, emulating their rugged surface and color variations. Our showrooms have a wide variety of ceramic & porcelain tiles to choose from and our design consultants are always there to help you avoid being overwhelmed by the options. Wood floors are a classic addition to any home. Engineered wood flooring can be used in some places solid wood planks cannot. And once installed, it can be difficult to distinguish an engineered wood floor from a solid plank floor. We understand your home is as unique as you are. That’s why Mill Creek showrooms contain a wide variety of engineered wood options to choose from. With design consultants to help you find your perfect floor and guaranteed installation - We make the buying experience as stress free as possible! 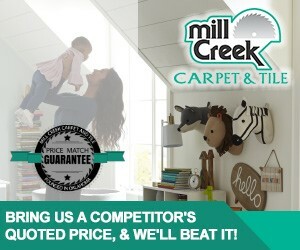 Mill Creek will provide a professional installation in accordance with the installation guidelines of the Carpet and Rug Installation Standards effective October 1, 2009. Mill Creek also provides a one-year warranty against workmanship defects..